This is one from the archives, if you’re a regular reader, or know me well at all, you’ll know that I’m a complete pasta fiend. I can’t get enough of the stuff and would eat it every day if I could. 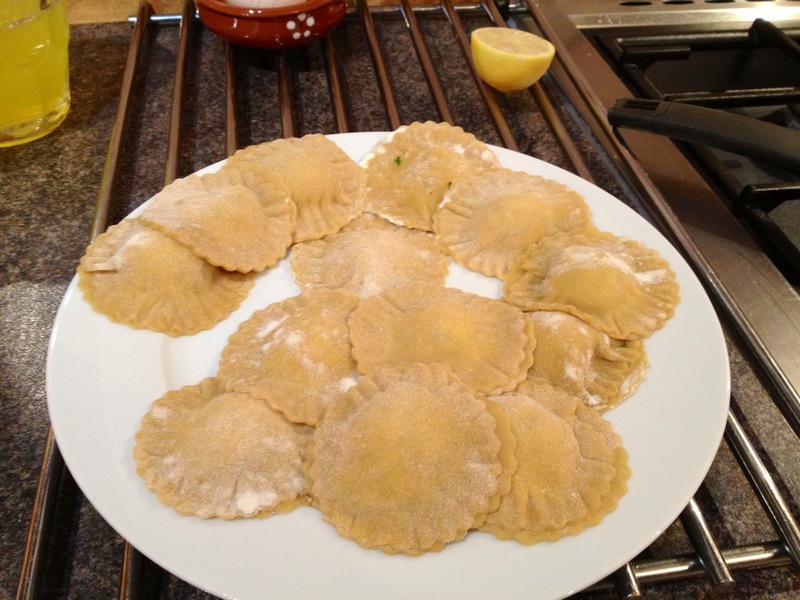 It didn’t take me long, once I’d learned how to make my pasta from scratch and given it a few goes to get the hang of it, to try my hand at ravioli. I think seafood works great in ravioli as its not as heavy as meat but makes a bit more of a substantial meal than a vegetarian option. 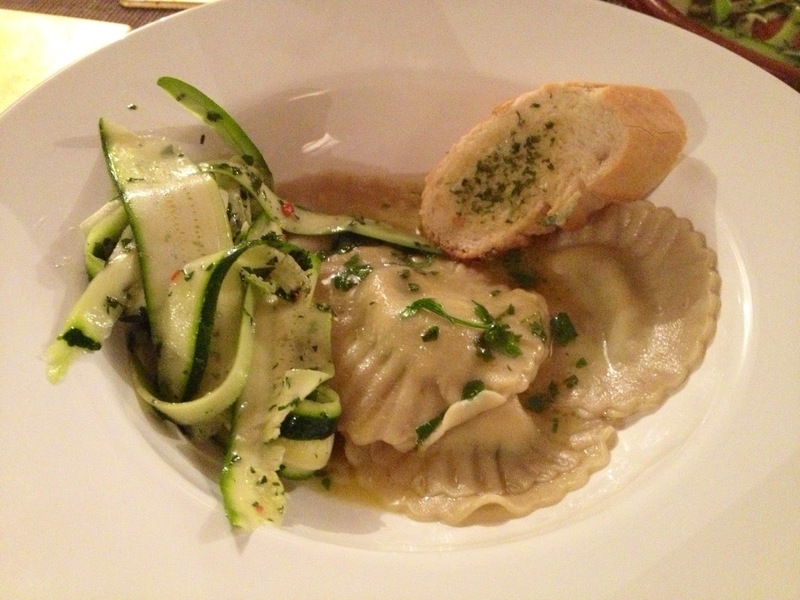 So I filled my ravioli with crab, served it with a lemon butter sauce, a courgette ribbon salad and garlic bread. Use my fresh pasta recipe to make enough for 4 people, but just roll out into sheets ready to cut out pasta shapes, don’t cut into ribbons. You’ll need a round cookie cutter to cut out the shapes. 1. Starting with the filling, mix together in a bowl the mascarpone, crab meat, parsley and lemon zest. Season with salt and pepper to taste. 2. After it’s been rested in the fridge, roll out your freshly made pasta until thin enough that you can almost see through it. Using the biscuit cutter, cut out an even number of discs with which to make your ravioli. 3. Use a teaspoon to put a mound of the filling in the centre of half of the discs. 4. Brush water around the edges and then top with another disc, pressing the edges down to seal. Try not to let any air get trapped in the parcel as this could cause them to burst open while cooking. Press the edges with a fork for presentation. 5. Place on a floured dish to dry while making the rest. 6. While these are drying, prepare the courgette salad. Finely chop the mint and chilli together until fine and mix in the lemon zest. 7. Mix together with the olive oil and the juice from the lemon. Season the dressing with salt and pepper. 8. 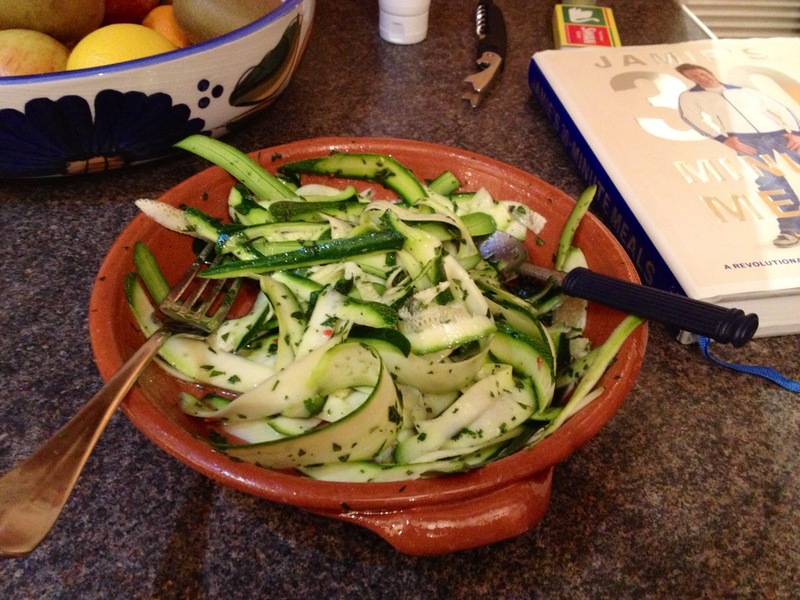 Slice the courgettes into ribbons using a vegetable peeler, and toss with the dressing until fully coated in a serving dish. This can now go to the table with a serving spoon for people to help themselves. 9. Now we’re ready to cook the pasta. Add the ravioli to a large pan of salted boiling water, bring to the boil then reduce the heat and cook for a further 2-3 minutes. 10. Meanwhile melt the butter with lemon juice until sizzling. 11. Drain the ravioli and serve in warm bowls. Drizzle the butter over the ravioli and serve straight away. Serve with garlic bread.